Last weekend NVIDIA’s employees chose hammers and shovels over hors d’oeuvres and Champagne, forgoing a holiday party and instead taking part in one of Silicon Valley’s largest-ever employee volunteer service events. About 1,500 employees, their families, and other volunteers descended on the nonprofit Full Circle Farm in Sunnyvale Friday and Saturday to saw wood, swing hammers, shovel dirt, paint and more. The result was a huge boost to the farm’s ability to provide nutrition education to students and fresh produce to the community. On Saturday morning about 1,000 grownups, teens and children were busily tilling soil, building new structures and planters, and painting murals on the 11-acre farm located on land leased from the Santa Clara Unified School District. The technology company stopped having holiday parties 11 years ago, and had been doing annual community service on a smaller scale, until 5 years ago when employees organized under the banner Project Inspire, said spokesperson Tonie Hansen. community. Today we list the ways we can all be better neighbors to the world. Good Neighbor Stories wishes everyone a very joyous holiday season to all! Please be a part of our neighborhood by leaving your comments and ideas. Share with us how you’re being a good neighbor to others, or how someone reached out and blessed you. Good Neighbor Stories is proud to announce our first virtual holiday food drive! Help us this holiday season raise money for Second Harvest Food Bank of Santa Clara and San Mateo Counties. Our goal is to raise $1,000 between now and Dec. 31. 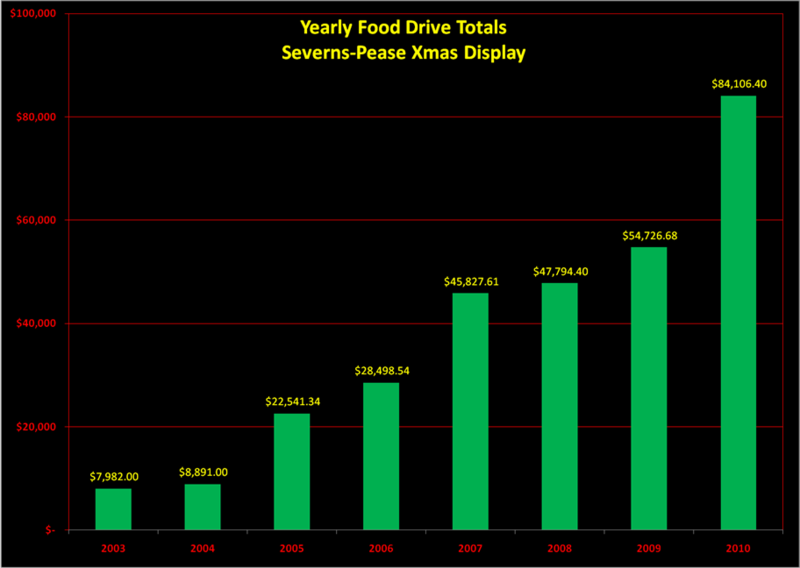 We’re sponsoring the food drive in memory of Dave Severns, who created the Severns-Pease Christmas Light Display in Sunnyvale. Last holiday season Dave raised more than $84,000 for Second Harvest. The food bank’s officials expect one in 10 residents of Santa Clara and San Mateo counties will turn to the agency for food this holiday season. The economy has driven up the numbers of our Silicon Valley neighbors going hungry; 80 percent of the agencies that distribute food from Second Harvest report an increased need over past years. Help us ensure that families experiencing hunger get access to food this winter by donating through our food drive. Shopping for a Christmas tree in Silicon Valley this weekend? You can find your perfect tree and help others at the same time by using our interactive map. Thank you to Los Altos Patch, which provided the information. Check out the article for more detail about each of the organizations sponsoring the tree lots. Don’t delay, because a few of the lots are open for a limited time only. For example, this is the only weekend for Trees For Troops at Battaglia Ranch in San Martin, a program that ships trees to military families. A part of the Spirit of Christmas Foundation, the program has provided approximately 84,000 trees to families since it began in 2005. Have we missed a lot that’s doing good this holiday season? Tell us in the comments section, and we’ll add it to the map. Update: See our 2012 map. Thanksgiving is behind us and we now start the march to the December holidays. Last year I ran a three-part series on ways to be a good neighbor during the holidays, and those ways remain as evergreen as well, holiday evergreens. Today I’m reposting part 1 about how to be a good neighbor in your own neighborhood. Parts 2 and 3 talk about how to be a good neighbor in your greater community, and in the world. Hope you enjoy these ideas, and please, share your own with us here! And if you do follow through on a good neighbor action this holiday season, share what happens with us here, too.